On March 22, an Audi will depart from the Golden Gate Bridge to take a 3,500 mile road trip to New York City. On the face of it, there’s nothing too remarkable about the fabled cross-country route that has been taken by many before. This trip will be a tad different: the car has been set up by electronics company Delphi, and will be the first autonomous vehicle to undertake the coast-to-coast venture. When most people think of self-driving cars, they think of Google, or perhaps automakers such as Volvo and Mercedes, all of which are working on high-profile autonomous vehicle projects. Delphi, who produce a huge range of electronics and developed the first electric starter in 1911, is far from a household name. However, the company has been at work on the sensors, cameras and controls necessary to make a self-driving car—and they’ve rigged up 2014 Audi SQ5 to put their technology to the ultimate test. According to Wired, the Delphi setup includes a camera in the windshield to observe road signs, traffic lights, and lanes, plus radars with an 80-meter range on each corner of the car, as well as the front and the rear. There are additional long range (180-meter) radars installed on the front and rear. 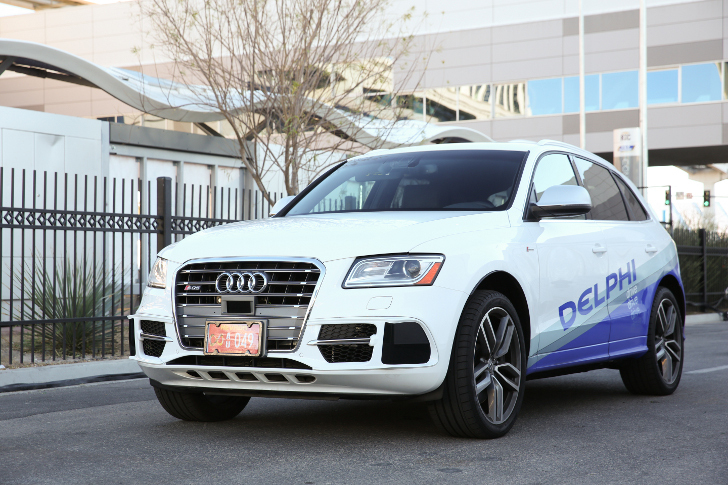 Departing from San Francisco on March 22, a team of Delphi engineers will travel six to eight hours a day in the vehicle, with the aim of making it to the New York Auto Show on April 4. The idea is that the engineers will not need to intervene in the car’s operation, but they will be alert and ready if necessary—and also present to meet certain state requirements, such as New York’s law requiring a hand on the wheel at all times. 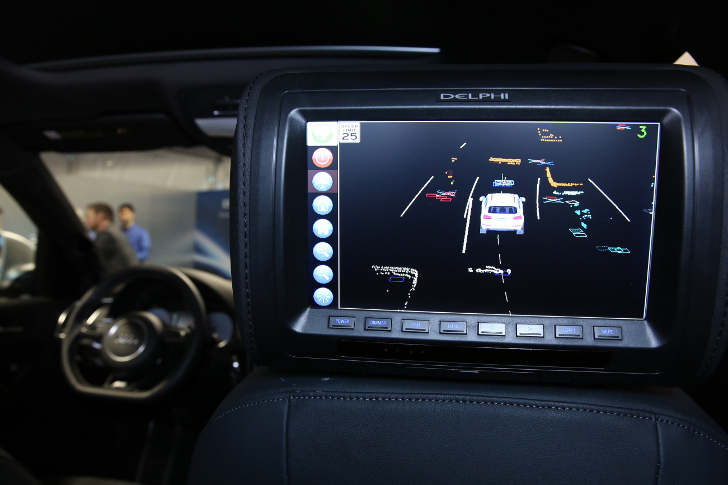 Delphi isn’t specifically looking to enter the self-driving car field, though. Instead, their sensors and radars fall within the category of ‘safety equipment’ which the company provides to other automakers—and successfully so, they hit $1.4 billion in sales in 2014 alone. By making their own self-driving car they are able to push the limits of their own technologies, putting them to the test in the wide variety of traffic conditions that they will traverse as they cross the country. On March 22, an Audi will depart from the Golden Gate Bridge to take a 3,500 mile road trip to New York City. On the face of it, there's nothing too remarkable about the fabled cross-country route that has been taken by many before. This trip will be a tad different: the car has been set up by electronics company Delphi, and will be the first autonomous vehicle to undertake the coast-to-coast venture.